Discussion in 'Electric Instruments' started by [email protected], Dec 7, 2012. Happy Friday you bunch of wood lovers... I guess I'll look at my 594 all weekend so I'm not sad about no pics here. There you go - slim pickings but better than nothing. It's a 2010 Private Stock 1985 re-issue I found on my travels. 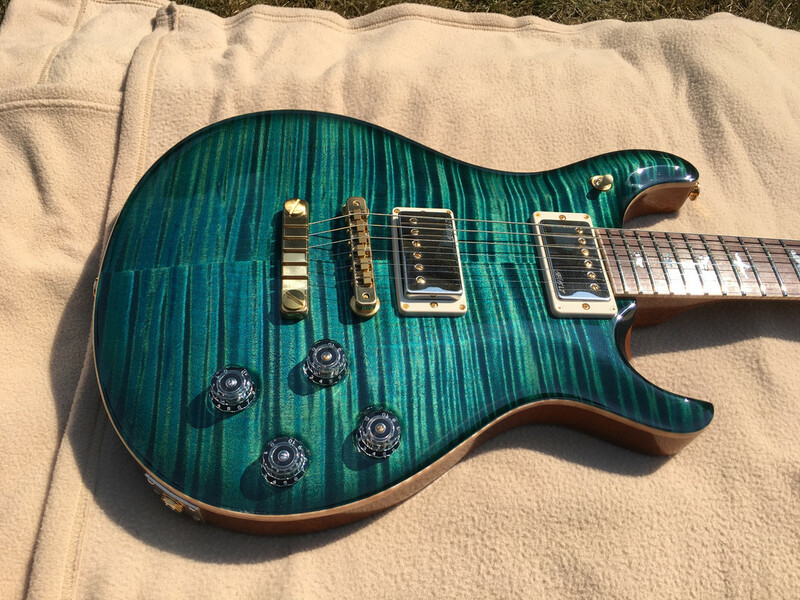 Not mine but for sale at World Guitars in England (a long-standing PRS and Private Stock dealer, so I hope it's OK to mention them). pauloqs, Boogie, Tonart and 5 others like this. This was my Private Stock for this Friday. pauloqs, ]-[@n$0Ma☩!©, Boogie and 14 others like this. This would go well with my Laguna 594 which also came from WG. Great folks! cubby61, pauloqs, AkiraSpectrum and 7 others like this. Glide-bpm and WA Paul like this. [email protected] PRS all day, every day. Happy Friday! What's your outside temp today? 19F and snowing here at the factory. cubby61, Mike Duncan, pauloqs and 13 others like this. cubby61, Mike Duncan, pauloqs and 11 others like this. Whoa that bearclaw top hollowbody will be haunting me. Thank goodness, it's 70 and decent here in San Diego today. Feel badly for those in the frozen spots. The GITD delrin binding is HOT! Spruce NF neck HB II. BOINK!!! TOL KOA?!?!? I hope that was custom ordered or my collection and wallet are in deep, deep trouble! Is that another Ocean Mist Glow I see below the GY II pic? One piece quilt back on a doubleneck??? Seriously??? This is getting out of control now. Ravenheart and Alnus Rubra like this. Whoever came up with this is a freakin' genius. Dooooood...NAMM has you guys on fire! Holy crap, gorgeous !! Hey everyone - I'm out of the office tomorrow so no Private Stock Friday. Mike Duncan, pauloqs, Ravenheart and 11 others like this. Mike Duncan, pauloqs, JonW and 11 others like this.